PARIS — Montreal's Felix Auger-Aliassime defeated South Africa's Lloyd Harris 6-4, 6-3 on Monday in the first round of the men's qualifying tournament of the French Open. 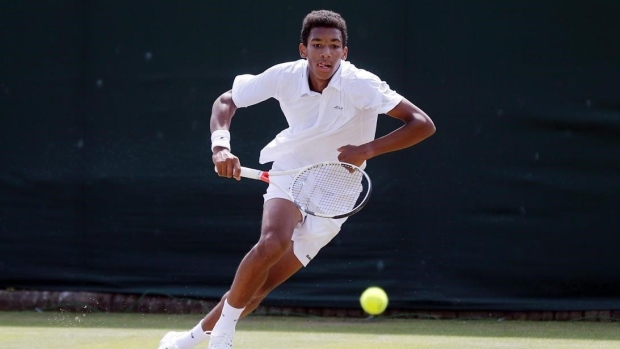 The 17-year-old Auger-Aliassime fired six aces to Harris's two. He will face Spain's Jaume Munar on Wednesday in the next round of the qualifying tournament. Also, Vancouver's Filip Peliwo lost to France's Constant Lestienne 7-5, 6-2. Denis Shapovalov of Richmond Hill, Ont., is already in the Grand Slam's main draw, while Milos Raonic of Thornhill, Ont., withdrew on Sunday. Peter Polansky of Thornhill, Ont., takes on Slovakia's Norbert Gombos on Tuesday as the first round of the men's qualifying tournament continues. Three Canadians will be in the women's qualifying tournament when it begins on Tuesday. Eugenie Bouchard of Westmount, Que., faces Slovenia's Dalila Jakupovic, Montreal's Francoise Abanda will play Italy's Martina Trevisan and Carol Zhao of Richmond Hill meets Italy's Francesca Schiavone.